The Biggest tech hiring boom since the 2000.com bubble means companies are luring tech talent where they can get it. USA Today reports some of the biggest technology companies in the world have begun an enormous wave to tech job hirings. Techies everywhere rejoice as they become very valuable assets again. Expect record-breaking salaries and perks for the Internet Marketing gurus out there. 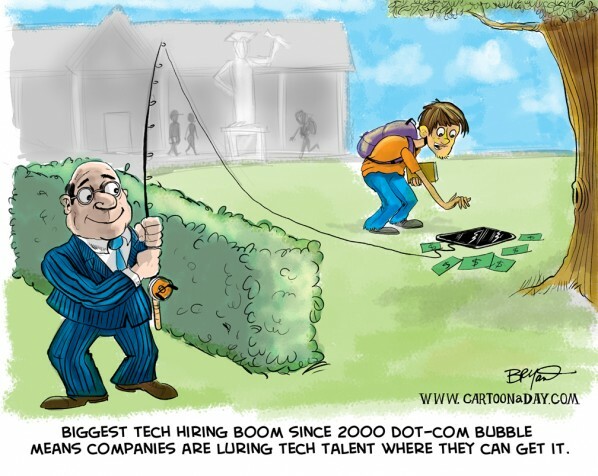 Inspiration: Funny cartoon featuring a businessman using a fishing pole and an ipad surrounded by money as a job lure. The college student is taking the bait.